I'm Rob Marshall, a military veteran using writing and poetry to find healing from war. I was never supposed to be a writer, but found solace after I started to write my deepest thoughts and emotions down. Your support will allow me to continue to write poems and raise awareness for the Veteran community. Your support will also help bring my writing into print and also allow me create video content and short films. Currently I am working on my first book of poems titled "War Poems:Over There. War Poems: Over There is a gut-punching journey into the soul of a soldier, with striking imagery relating war experiences in Iraq and the later acclimation to civilian life. It is a collection of deep and honest thoughts on war and its aftermath without glamour or flag-waving. Regret, suicide, love, lost, naïveté, destruction, are deeply woven within the candid poetry of Over There. If you have ever wanted to feel and discover what Veterans face both in the heat of battle and in the silence of suffering, Over There will open your heart. For being a great supporter you will receive a giant hug from me, mentioned on social media and website, and unedited editions of poems. For being a great supporter you will receive an ebook of poems written every month, mentioned on social media and website, and unedited editions of poems. 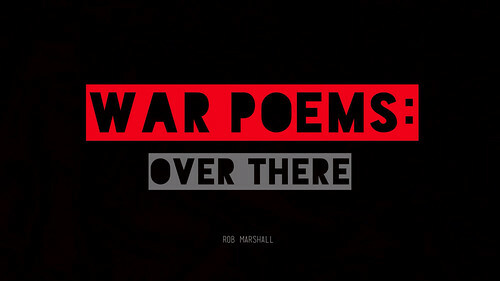 You'll receive my first edition ebook War Poems: Over There. You will receive all the awards above, plus a signed copy of the finished book! All funds will go towards purchasing materials and supplies to print and bind my first book of poetry War Poems: Over There. Pledges go towards printing and paper coats, as well as any equipment needed to do the binding. I will bind the book by hand to give something special back to the people who have supported my writing and vision.